The new Ford Explorer is mere months from dealers, but as nice as it is, it’s not going to be anywhere as cool as today’s Nice Price or Crack Pipe Adrenalin—sorry Ford. Let’s see if its is as aggressive as its look. Pretty much everybody likes the old Subaru Forester. After all, it’s a decently sized wagon that could be had with a stick and which provided standard and secure AWD. Still, not everyone can leave well enough alone, and that’s how we got to yesterday’s custom 1999 Subaru Forester. Yes, it had the AWD. And sure enough it sported a stick. The custom bit—and the part that caused the most pearl clutching—was the roots-style supercharger that had been cobbled up on top of its pancake four. That proved to be wildly contentious with half of you convinced the blower was functional and the other half was just as sure that it was just there for show. In the end, it squeaked by in an impossibly close 50.45 percent Nice Price win. Sheesh! You know, in the face of inclement weather AWD is sure a good thing. Right now there’s a good bit of the country facing just such daunting driving conditions. Not here in LA where I live mind you—we’re experiencing beautiful days in the mid-70s this week—but in much of the rest of the country it’s cold, snowy, and I would imagine, kind of miserable. You know what would cheer everybody up? That’s right a Ford Explorer Sport Trac. 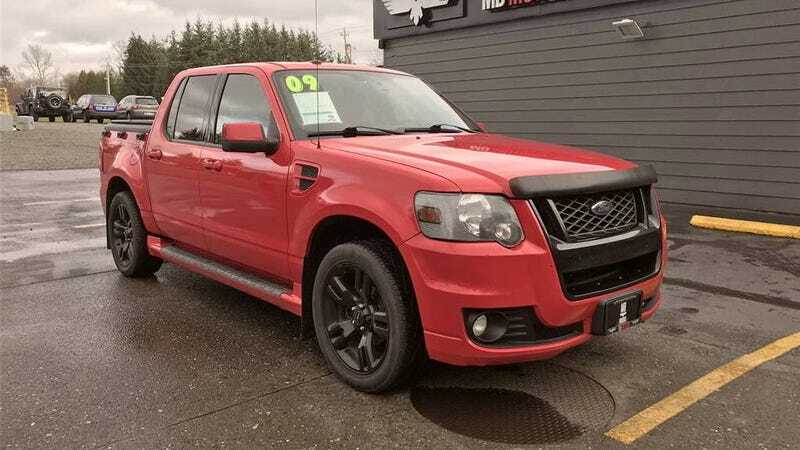 Add to that an aggressive trim package like on this 2009 Adrenalin edition and you’ve got yourself a truck that’s sure to beat back those winter blues. The Explorer Sport Trac debuted for the 2001 model year as Ford’s mid-sized crew-cab hauler. With a four and a half foot bed, the Sport Trac wasn’t really all that useful as a pick up truck, however a clever swing-out gate that would extend the load area over the dropped tail gate did help. Still, the Sport Trac was and is pretty cool looking. This ’09, which comes with a clear title and 128,000 miles on the clock is also kitted to the hilt. It not only wears the aggressive Adrenalin factory body kit but is also a top of the line Limited model which means it has a lot of swank accessories to go with its assertive looks. Ford initially intended the Adrenalin package to offer a 390 horsepower supercharged 4.6. By the time the production model hit the showrooms however, that hot mill had been exorcised, leaving just the 292-horse naturally aspirated version of the 3-valve per cylinder V8 to do ultimate battle. That’s backed up by Ford’s 6R60 six-speed automatic, a gearbox built under license from ZF and made standard in the 2nd gen model. Full-time AWD and an four-wheel independent suspension round out the notable mechanicals. The body of this Sport Trac looks great, although the black-painted alloys are a take it or leave it addition. The Adrenalin body kit includes unique front fenders and facia, along with full-length rockers with step and a deeper rear valance. A bed cap keeps out both the snow and nosy nates, and the truck does have the deployable gate the make the bed a bit more useful. Inside things seem equally up to the task. It’s perhaps quite surprising, but Ford interiors of this era weren’t half bad. Sure, there’s a lot fo hard plastic in here—a lot— but it all seems to fit together well and styling wise all appears to have held up here a decade later. The only obvious indicator of its age is a head unit in the dash that lacks the now ubiquitous big screen and multi-function features. The leather on the seats looks good, as does all that hard plastic surrounding them. With a V8 and AWD you’re not going to get great mileage and sure enough the Sport Trac is EPA rated T for Teens. That being said, it’s going to look good while burning all those dead dinosaurs and gas is cheap right now anyway, right? The original sticker on this truck would have been little north of thirty-five grand rolling off the lot. The asking price now is a more modest $14,500, but that should be tempered by the fact that this is a decade-old Ford truck with limited utility. In support of that price, it’s still a pretty viable daily driver ride—fuel economy notwithstanding—and looks pretty hot to boot. What do you think, could you get excited about this Adrenalin’s $14,500 asking? Or, is this a Sport Trac that’s sporting a price that doesn’t track at all? eBay out of Ferndale, WA, or go here if the ad disappears. At $3,500, Will This Supercharged 1999 Subaru Forester Blow Your Mind? For $32,999, Could This 2010 Ford Explorer Sport Trac Adrenalin Get Your Heart Pounding?